In this unit you will learn intervals, chords and strumming notations. A harmony is two or more noted that sound simultaneously. Below are two types of harmonies played on the guitar: the interval and the chord. 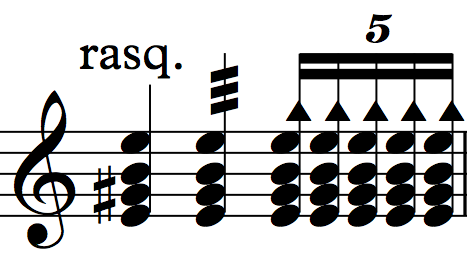 The interval consists of two vertically stacked notes. The stacking indicates that the notes are to be played simultaneously, or nearly simultaneously. The chord consists of three or more vertically stacked notes. The stacking indicates that the notes are to be played simultaneously, or nearly simultaneously. The strum consists of a wavy line that directly precedes an interval or a chord. The down strum consists of a wavy line with an arrow pointing to the top of the score that precedes an interval or chord. The arrow direction indicates that the strum should start with the low pitches and proceed to the high pitches. Alternatively, an arrow pointing to the top of the score can be placed directly above the interval or chord meant to be strummed. The up strum consists of a wavy line with an arrow pointing to the bottom of the score that precedes an interval or chord. The arrow direction indicates that the strum should start with the high pitches and proceed to the low pitches. Alternatively, an arrow pointing to the bottom of the score can be placed directly above the interval or chord meant to be strummed. The rasgueado is associated with flamenco guitar technique but is actually used in many genres. It is commonly notated in the following ways: with the abbreviation rasg., with the tremolo symbol or as a set of sixteenth notes in combination with up and down strum symbols. capable of clearly observing the subject and event in question? qualified to comment on the particular subject in question? unshackled from a bias toward you or the subject in question? capable of giving critical yet constructive feedback? applying the advice given to you in his or her own life? The next exercise is transcribed for voice and two guitars. However, the play-along track contains only the Guitar 2 part. I included the vocal part in the score in case you aspire to perform this exquisite song with a singer and another guitarist! Macaria is in 4/2 meter. Each measure contains four pulses (beats) and each pulse is a half note. Since there are four half note pulses per measure, the count-in bell will be struck four times. The Guitar 1 part of Efykay contains two voices, which makes sight-reading difficult. If you would like to simplify the sight-reading process, I suggest you sight-read Guitar 1’s top voice only, then Guitar 1’s bottom voice only, and finally, attempt to play both voices at the same time.